You might not have heard of Segula Technologies, but the company is presenting a hybrid SUV at the Mondial de l’Automobile, the Paris Auto Show with very promising performance, at least on paper. The Hagura is truly groundbreaking and could change the way we think and expect a hybrid SUV. Again, a technology company is spearheading such a disruptive paradigm shift we can only hope will make its way to the mainstream manufacturers. Segula Who? Their Segula Technologies website starts by laying down the foundations with the first sentence on the hybrid page reading: “Environmental protection is not an end in itself, but an implicit input of human activity on our planet.” But more than that, Segula Technologies is an international engineering and consulting company, something it is hoping to apply to the automotive industry. Segula Technologies Portfolio. Segula Technologies has an impressive portfolio and you might remember my previous articles in another media outlet about their EF01 project the company claims is the fastest 100% electric single-seater in the world. With a maximum speed of 155 mph, with acceleration in under 3 seconds for the 0 to 60, this single seater racer has an autonomy of 20 to 25 minutes using a 2 speed gear box putting out a healthy 200 kW, close to 260 hp. It also has a few Peugeot prototypes it’s worked on, the EX1 and RCZ. Technically Speaking. The oddity here is that the Hagora uses a two-stroke engine to power its hybrid drivetrain. Two-stroke engines are not your run-of-the-mill choice for powering cars but have a few advantage 4 strokes don’t. By using a direct-injection system in its two-stroke architecture, the engine develops 120 HP, which powers a 100 HP electric motor using continuously variable transmission, CVT. This is the second oddity, a CVT transmission that can handle the torque of an electric motor. But the real saving is in the reduced weight between the gasoline engine, electric motor and transmission, 423 Lbs, much less than a traditional gasoline engine. This architecture only weighs in at 1,873 lbs. On the electric side, the Hagora uses a 1.5 kWh battery pack, which gives the hybrid drivetrain a 160 kW, 217 HP total output. Hagura's Potential. As I mentioned before, the Hagura has a lot of intriguing potential, if not at least on paper. With its innovative hybrid powertrain, it also sports a composite construction housing a smart layout 2 seats only with modern attractive crossover design. Drivers will be able to choose what they need, and when they needed. Need a quick drive to pick up the kids or a coffee run? Then the all-electric mode will do just fine. Need to take a longer trip? Then the hybrid mode will maximize the usage of fuel. Rethinking Weight & Connectivity. If using a two-stroke engine is gutsy, Segula Technologies pulls a truly evolutionary trick out of its hat in the communication department. In order to further gain on weight reduction, it bypasses the usual electrical equipment wiring by using the driver's smartphone or tablet for control. By connecting smart device using the MiWi wireless protocol, the driver controls ventilation, audio, as well as getting vehicle settings information. Segula Technologies shows how far the state of electronics has come for the automotive industry. While we have previously seen how a few entrepreneurs disrupted the automobile industry, Segula Technologies is yet another company taking the opportunity to show how its technology and engineering can help shape the way we design, engineer and build tomorrow’s alternative energy cars. 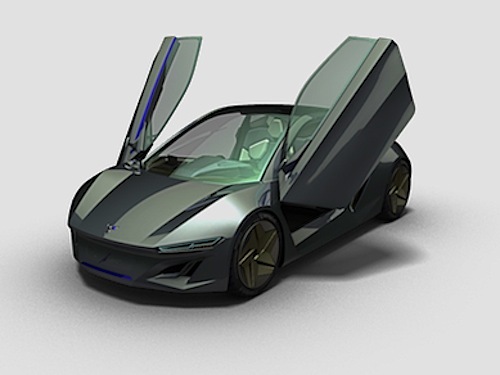 We most likely won’t see the Hagura on the road, in Europe or here but you can be sure some of the components or aspects of what Segula Technologies has shown us with its Hagura will make its way to future hybrid designs.